Teenagers and young adults ages 18 to 25 accounted for nearly half of King County’s 74 homicide victims in 2017, representing a modest spike over the previous year. The number of young people — particularly young men of color — killed in confrontations with police also increased. After being stalked for days, 22-year-old Evelyn Zaragoza was fatally shot in the head in a Federal Way parking lot in November, according to police and prosecutors. The circumstances of her death reflect intersecting trends that were seen in homicide cases investigated last year across King County, where the number of victims and suspects in their teens or early 20s surpassed those of the same age group in 2016. Zaragoza was also the youngest of seven women allegedly killed by a current or former intimate partner in 2017, nearly double the number of female victims killed in domestic-violence-related homicides the previous year. The arrest of Zaragoza’s ex-boyfriend, Erik Guzman Naranjo, also points to something police and King County prosecutors are seeing more and more: Guns stolen in residential burglaries are increasingly making their way to the streets and into the hands of young people. When Naranjo, 22, was arrested in Oregon on his way to Mexico two days after Zaragoza was killed, police say he had a stolen .45-caliber handgun and a 9-mm handgun with the serial number scratched off, according to the first-degree-murder charge filed against him. With a $1.5 million federal grant, the prosecutor’s office and several police departments — including Seattle, Renton, Kent and Federal Way — have worked for the past 1½ years to set up data-sharing tools on shots-fired calls, Larson said. It took time to get the data flowing, and the prosecutor’s new crime-strategies unit is now at the point of scrubbing and collating that information. But early data points to a simple truth: “The more you associate with people with firearms, the greater your risk of either being a victim of gun violence or a perpetrator,” Larson said. Each shots-fired call represents the potential for a homicide — and people willing to fire guns in public are likely to do so again, said Sgt. Sean Whitcomb, a spokesman for the Seattle Police Department (SPD), which began collecting shots-fired data several years ago. The whole point of the data sharing is to apply a social-network analysis to the numbers and link people to incidents — and each other — through police investigations, Larson and Whitcomb said. Police haven’t seen an increase in random violent crime, which means it’s crucial for investigators to understand the relationships between people involved in violent incidents. Nearly three-quarters of the county’s 74 homicide victims in 2017 died as a result of gun violence, the same ratio seen in the previous year, when 66 people died from homicide, according to a Seattle Times database with information compiled from police, court records, prosecutors and the King County Medical Examiner’s Office. Among last year’s dead were three juveniles and 29 young adults ages 18 to 25, a demographic that accounted for 43 percent of 2017 homicides, up from 30 percent of homicides in 2016. Homicide suspects in the same age group likewise increased: Prosecutors charged 43 suspects in 38 cases last year — mostly with murder or manslaughter — and 63 percent of them were juveniles or young adults ages 18 to 25, according to The Times’ analysis. In 2016, 51 percent of 43 homicide suspects fell into the same demographic. Additionally, seven of the 11 people who died in officer-involved shootings in 2017 ranged in age from 17 to 25, representing 64 percent of the total. In 2016, only two of eight peopled killed in confrontations with police involved young adults, age 21 and 23, respectively. In 2016, five of the men killed by police were white, one was black and one was Asian. The sole woman killed by law enforcement was Native American. But in 2017, men of color made up the majority of those killed in officer-involved shootings: five were black, two were Asian and one was Native American. A black woman and two white men made up the remainder. There were nine fatal officer-involved shootings in King County in 2015 and three in 2014, according to a Times analysis. Not including officer-involved shootings, black males accounted for a disproportionate number of homicide victims in 2017, as they have in previous years. They accounted for 26 — or 35 percent — of the county’s 74 homicides, with seven black females making up another 9 percent in a county where blacks account for less than 7 percent of the 2.1 million population, according to U.S. Census estimates for 2016. There were 28 white homicide victims — 21 males and seven females — accounting for 38 percent of the total in a county that is 70 percent white, the data shows. Other victims included: four Asian males, three Native-American males and four males whose race was listed as “other” by the medical examiner. Two women, one Asian and one Native American, were also victims of homicide. The county’s two largest police agencies — the Seattle Police Department and the King County Sheriff’s Office — each solved two-thirds of homicides committed in their jurisdictions last year. 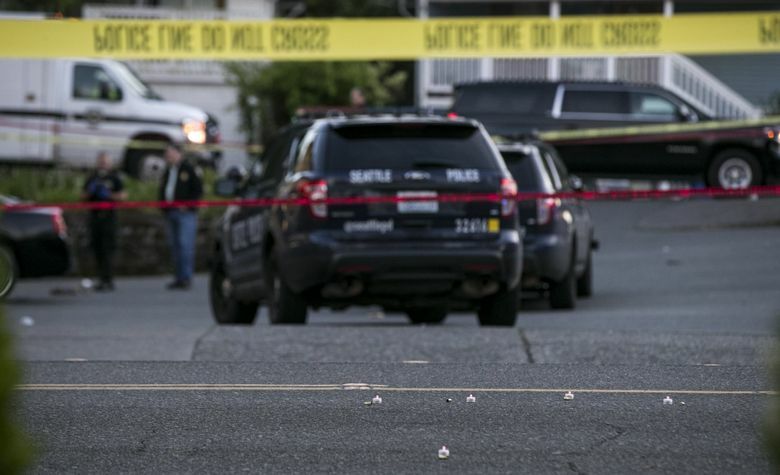 Seattle police solved 67 percent of the 27 homicides committed in the city, while sheriff’s detectives closed 70 percent of the 20 homicide cases from unincorporated areas and cities that contract with the sheriff’s office for police services. Kent police solved half of that city’s 12 homicides, and Federal Way police have made arrests in all but one of seven homicides committed there. Across King County, two homicides were possibly accidental, four others were committed in self-defense, one is still being reviewed by prosecutors, and 24 remain unsolved. Another five homicides were committed by killers who then killed themselves, a significant increase from the single murder-suicide investigated by police in 2016. In 2016, domestic and family violence claimed 10 victims — four children under age 2, four women and two men, one of whom was stabbed in the chest when he intervened in a fight between his mother and her boyfriend, and another who was fatally stabbed by his girlfriend in an act of self-defense. Last year, 14 people — two 2-year-old boys, two men and 10 women — were killed by a parent’s significant other, a family member or a current or former spouse or intimate partner. While both toddlers were fatally beaten, seven of the adult victims died from gunshot wounds. In four of the domestic- and family-violence cases, the girlfriend of a male victim, the husbands of two female victims and a son who shot his parents also killed themselves.